Legal compliance is one of the most important things dealers are faced with today. Keep your dealership in check and maintain all safety rules to avoid unnecessary investigations and fines that can cost you up to $5,000 per failure. Autoxloo’s compliance program is designed to help you easily control these failures and keep your dealership 100% safe and functioning as it should. The FTC has indicated that dealerships are fully responsible for all inappropriate actions of their employees. Train your entire staff to do business so they do not rely on their own understanding of doing business the way it’s always been done. Start using Autoxloo’s ComplyApps™ today to protect your business. Dealer Compliance Consultants specialize in affordable compliance resources and education for dealers. In addition, they provide compliance support to the dealerships. 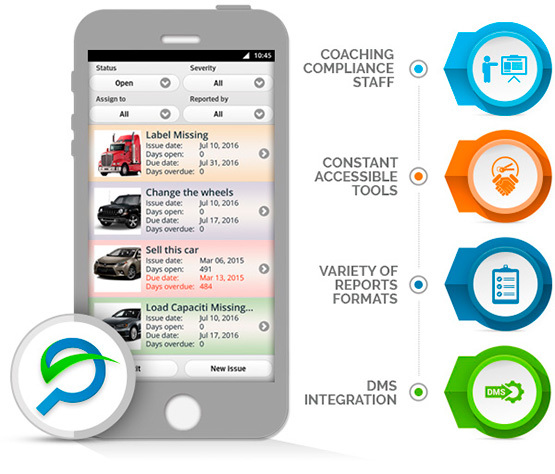 Have your internal inspectors find the faults within your dealership and report them through the ComplyApps™. This will help the dealership be fault-free before FTC comes to inspect your dealership. Your inspector will report the issues aim, priority, and the cost for the fine if it is not fixed. The app includes an escalation process which can help identify the individual responsible for the fault and monitor him/her until completely fixed and resolved. Following the proper procedures and instructions is vital in order to avoid the costly fines. Our app makes the process enjoyable while staying organized to providing safety throughout your dealership. The ComplyApps™ app helps the compliance support spend less time determining payments for fines and spend more time improving the dealerships functionality and safety. Using Autoxloo’s application dealers are supported to maintain compliance. As soon as you adapt to this solution, you will immediately begin to see results. Don’t wait, contact us now to start!